Game 1 is the novice slalom run. It has 20 gates and a fairly tame slope. The skier begins this and every run in Position 1R. Since the first gate is to your left, tap the joystick lightly to the left twice. This will move you through Position 1L and start you moving slightly to the left in Position 2L. You will have to move left only a little. To stop the left movement of the skier, tap the stick once to the right; this will get him started directly downhill again (Position 1L) to just clear the right flag of the first gate. The gates are numbered according to how many you have left to go, with the number of the gate you are approaching shown on the top of the screen, above your time. So, with Gate 20 out of the way, tap the stick gently to the right twice to move through Position 1R, moving slightly to the right in Position 2R. Again, you will have to move only a little--just enough to clear the left flag of the Gate 19. Do the same to clear Gate 18. It is critical that you get as close to the left flag of Gate 18 as possible. If you can squeeze right up against it without actually hitting it, you can stay in that downhill run right through Gates 18, 17, 16, 15, 14, and 13. Gate 12 will be to your left, so be ready, perhaps even as you are moving through Gate 13, to move a little to the left to clear the right flag of Gate 12. Gate 11 is a little farther to your right, but is easily cleared if you are watching for it. If you can keep close to the right flag of Gate 11, you can stay in that downhill position for Gates 11 through 8. When passing through 8, start moving a little to the right to clear Gate 7. Stay close to the left flag, which will put you in a good position to clear Gates 6 and 5. Gate 4 will be a little to your left--no problem, except that you must now prepare to go through Gates 3, 2 and 1. All of these are quite far to the right of each other, so you must start your gentle movement to the right early to avoid having to make sharp right turns, which are costly in terms of time lost. In summary, Gates 12, 7 and 3 are those for which you must be ready. Start your approach to these early, while you are clearing the previous gate. You must be moving straight downhill for as much of the run as possible; use Position 2L and 2R (those which make the skier move only slightly to the right or left) only to get into position for each gate. Any other positions are only for emergency maneuvers; however, it is better to use them rather than to smash into a flag, since it takes a fair amount of time to get back up and continue the run. You should not aim for the middle of the gate, but for the inside flag in most cases. It helps to be prepared for Gate 27, but the real problem comes at Gates 20 and 19. You must start preparing for 19 long before you clear 20, or you will have to make a very sharp turn to get back on the track. Gate 8 is off to the right, so be ready to cruise through it and then through 7 at the same angle. You will not be able to use the straight downhill positions at all for these combination Gates (20 and 19, and 8 and 7). Other than these two problems, if you keep your eye on the bottom of the screen to get as much warning as possible of upcoming gates, you should not have too much trouble. Needless to say, it is a tremendous help to memorize the pattern of gates. Move the joystick left or right to position your skis. There are eight positions for the skier, each of which has two degrees of movement. To accurately control this movement you must tap the joystick in the desired direction, rather than pressing it. Each tap makes the skier move more to the left or right, depending on which way you tap. Since there are 15 directions for the skier to move and only eight visual positions for him, it stands to reason that only every other tap will result in a visual change in his position. Nevertheless, increasing the angle at which he skis down the hill will result in time loss, even if you cannot see the difference. Also, sometimes there seems to be a lag between the time that you hit the joystick and when the skier's direction actually changes. Resist the temptation to hit the stick again; it will move you to the next position and turn you too far. This advice becomes more important as you become more proficient at each run. At first you will find yourself madly weaving back and forth between the gates, and the nuances of movement will seem insignificant. There are two positions in which the skis point downhill; one has the body leaning slightly to the right and the other has him leaning slightly to the left. Both of these have a straight downhill direction (Positions 1L and 1R) and also one which drifts the skier into the direction in which he is leaning (2L and 2R). These four positions should be all you need as you become familiar with each course. Other positions will result in a significant loss of speed. The red button is a reset in the slalom runs only. In the downhill runs, when the right difficulty switch is on A, the red button causes the skier to jump when pressed. This is necessary to avoid falling on the moguls. When the right difficulty switch is on A, the slalom runs become harder because trees are positioned directly in front of the gates. When the left difficulty switch is on A, the skier gains the ability to move off the trail, skiing as far left or right as he wishes. On the slalom, this is unnecessary, but if you wish to do so, the gates reappear as you continue. In downhill racing, moving "around the mountain" makes an interesting trip, but is inefficient, timewise. Scoring in this game is strictly against the clock. 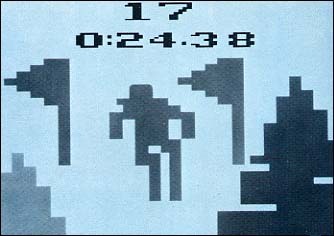 Each run is different and therefore has its own time to beat (these are not listed in the instruction booklet--you will have to guess) with Game 3 as the standard for the Activision ski team. If you can make this in less than 28.2 seconds, I guess you can go to the Olympics (as a spectator, and at your own expense). Games 1 through 5 are slalom runs, with gates. There are moguls, but the skier has no problem with them. Games 6 through 10 are downhill runs with no gates, just trees and dangerous moguls. When the difficulty switch is on b, the skier jumps over the moguls automatically; when it is on you must jump them using the red button on the joystick. Activision's Skiing will never replace "tight boots, cold hands, long lift lines" etc., but it is an entertaining video game whose charm lies in the fact that the player can become noticeably better in a reasonably short time. Also, since there are games whose patterns offer a new challenge each time, the inevitable boredom is slow in setting in. Game 1: Novice slalom run with 20 gates. Game 2: Intermediate slalom run with 40 gates. Game 3: Expert slalom run with 30 gates. Game 4: Olympic slalom run with 50 gates. Game 5: Same as Game 3, except that each time you turn off the power or select another game, you get another pattern of gates. Since the pattern will not change until you do hit the power or select switch, you can play each run until you become proficient, and then get a new one for another challenge. Game 6: Novice downhill run--200 meters. Game 7: Intermediate downhill run--300 meters. Game 8: Expert downhill run--500 meters. Game 9: Olympic downhill run--900 meters. Game 10: Same as Game 9 except, as in Game 5, you get a new pattern of trees and moguls each time you select Game 10.